These Swiss Potatoes are an easy side dish to prepare and tastes delicious. Warning – they are addicting! What’s not to love about potatoes and ooey gooey cheese? The first step is to slice your potatoes very thin – like you were going to make chips. They are layered at the bottom of a 9×13 pan. Then season with salt and pepper and top with shredded Swiss cheese and dot with a bit of butter. Repeat. The final step is to pour on top chicken broth. Don’t worry, it will absorb into the potatoes while they cook and leave loads of savoury flavour. The potatoes come out tender and perfectly cooked. My favourite part is that golden Swiss cheese on top. I couldn’t stop eating it! Serve this simple side with some chicken or beef. It’s a recipe I’ve been making for years and is always a hit! Not a fan of Swiss cheese? Experiment and try another type of cheese that you enjoy. 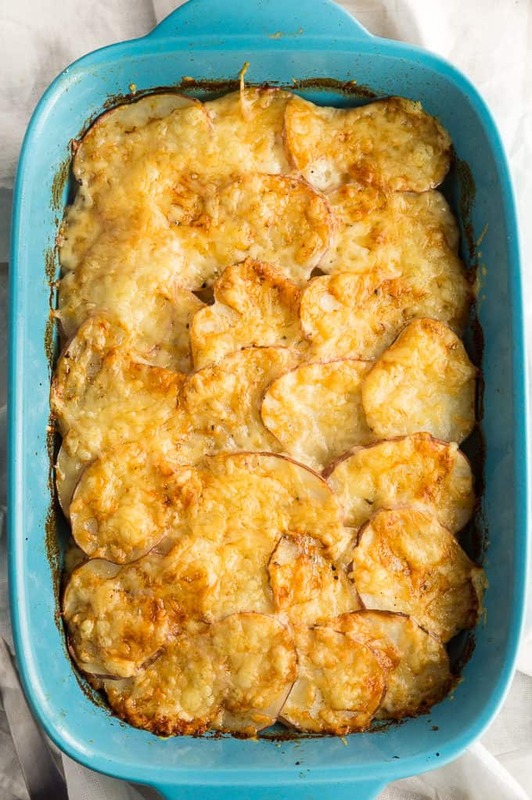 Potatoes and cheese are a winning combination, don’t you think? You might also like this Mashed Potato Casserole. 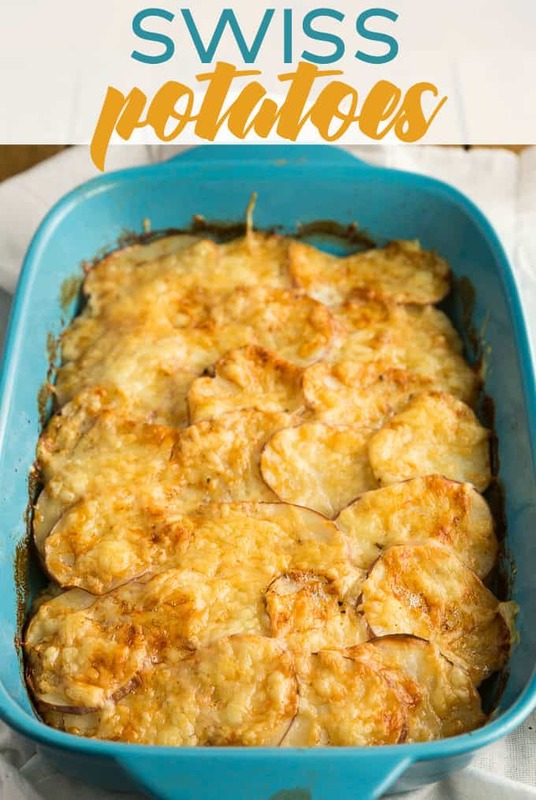 Layers of sliced potatoes and Swiss cheese make this easy side dish a winner! Preheat oven to 425F. Grease a 9×13 baking dish. Add half of potatoes evenly on the bottom of the dish. Season with salt and pepper. Spread 1 1/2 cups Swiss cheese on top. Dot evenly with 2 tbsp butter. Repeat layers. Pour chicken broth over top. Bake 45 minutes until potatoes are cooked and the cheese is golden brown. Serve hot. Thanks for the recipe,my kids will love those ! Love new recipes for potatoes! This looks so yummy! Thanks for posting! Sounds like a great potato dish to me. I have made a similar with cheddar cheese, will have to try it with Swiss. i am going to keep this recipe handy for when my hubby’s potatoes come in this summer! Now those look good, printed for tomorrow’s dinner, thanks! This would be great with gruyere cheese too. I love it with potatoes. This looks delicious and pretty easy to make. I love swiss cheese, this looks like a great way to enjoy it! These looks amazing! And easy too! Thanks! These look so delicious! I am all about easy sides I can toss in the oven. This is perfect for that. Thanks for the recipe!! I just love everything popato related. And your recipe looks so simple, and delicious! Pinnin it for later ! We will really enjoy your Swiss Potatoes! Hope you are having a great day and thanks so much for sharing with us at Full Plate Thursday! These are so yummy I am almost tempted to go off my diet for them. I am a huge potato lover. Your Swiss potatoes look delicious and sound pretty easy to make. Thank you for sharing your recipe at the Snickerdoodle Create~Bake~Make link party! Forgive me if I’ve missed something. It says 1 cup chicken broth in the ingredients list, but it doesn’t say what to do with it in the instructions (that I can see). Where does the chicken broth go? Can’t wait to try these, but want to do it correctly. Thanks! Thanks Cathy! I’ve updated the instructions. The chicken broth goes on top at the very end. I apologize it wasn’t clear (oops!). The Swiss potatoes look so delicious and easy to make. I have everything needed to make this delicious recipe! I will be making it today! 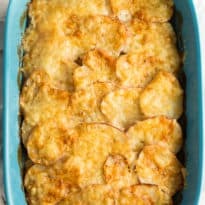 This looks wonderful, and I’m a huge fan of Swiss cheese, and this is a perfect way to make a dish everyone will love – I better make two batches! This looks delicious. I love Swiss cheese too. I’ll be making these potatoes for dinner real soon. Great idea for a potluck too. Thanks for sharing. Would love to have share on my Sunday’s Best Linkup. Starts every Saturday at 8:00 pm EST.